However, the nation eventually got the hint that Dame Patience Jonathan was in Horst Schmidt Klinik in Wiesbaden, Germany, being treated for an undisclosed ailment. On her arrival at the country, she tried frantically to dispel the rumours making the rounds that she had gone to Germany for cosmetic surgery/Liposuction, noting she was grateful to God Almighty for creating her the way she is. She told curious well-wishers that she never went for any cosmetic surgery and that she was not suffering from any terminal illness, contrary to media speculations. “I do not suffer from terminal illness. I did not go to the hospital mentioned. I did not even know the hospital,” She said. 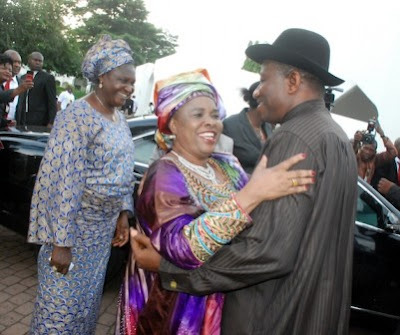 The visibly elated President Goodluck Jonathan was there to welcome his cherished jewel with a hug. Bayelsan Women dressed in their traditional attires rendered praises to God with special music and dance steps, for sparing the life of their daughter-in-law. 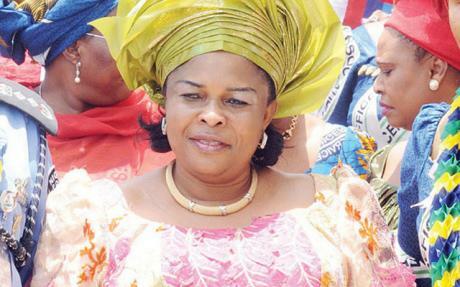 Dame patience Goodluck Jonathan left the shores of Nigeria for Germany precisely on the 28th of August, 2012 for medical attention. Up till now, Nigerians were never told the actual ailment she was being treated for. We all thank God she is finally back. What do you think? Should our leaders always keep Nigerians in the dark when it comes to health issues? Please share you views with us. Thanks for your wishes. God bless you.